Trailhead and parking area are at Gunstock Mountain Resort. The access road begins on the south side of Rt. 11A, 3.5 miles east of Rt. 11B and 5.2 miles west of Rt. 11. Gunstock Mountain is the second highest peak in the Belknap Range. Located immediately north of Belknap Mountain, it is a major destination for all kinds of recreational activities, including skiing, ziplining, and obstacle courses. These attractions certainly don't arouse a particularly remote atmosphere in the hike, but on your trek you will discover a few places of solitude and vistas in this fairly civilized environment. There are two good viewpoints along the trail in addition to the sweeping panorama of Lake Winnipesaukee seen from the summit. On the ascent, you will visit Mt. Rowe, which also offers some views. Begin your hike in the main parking area for the ski area. Head to the front of the lot and walk over the bridge and across the crosswalk to the front of the ski lodge. Head straight through the ticket area, between the two buildings, and follow the gravel walkway. Join a paved path, and walk to the left of a pond. At the end of the pond, as the road continues past a gate ahead, turn left onto Ridge Trail (look for the sign), a cell tower access road at this point. Pass beneath the tracks of Gunstock's newly built "Mountain Coaster" and begin ascent of the lower slopes of Mt. Rowe. The trail/access road quickly passes by the top of a snow tube jump and continues climbing alongside a ski slope, paralleling the Mountain Coaster on the right. After half a mile, the road swings left around the top of the ski slope and forks. Stay left, as the other fork goes under the Mountain Coaster. Another path diverges left just beyond; stay right this time, continuing on the access road as it passes the top of the Mountain Coaster. The road climbs steadily, soon steepening. Look back as you climb for glimpses to the east. As it nears the summit, in a second swing to the left, look back for a good view of Mt. Washington between the Sandwich and Ossipee Ranges. The road then reaches the cell tower atop Mt. Rowe at one mile from the parking area. There is a limited easterly view from a power line cut where you can see straight down to the base area of Gunstock. Bear left into the woods at a post and trail markings and cross the highpoint. Ridge Trail then descends slightly, passes through a bush-lined corridor and emerges in a grassy opening with good views. Straight ahead, you look out over the extensive ski trail network of Gunstock and to Belknap Mountain beyond and more of the Belknap Range to the left. Here, also, there is a good view straight down to the base. Out to the east, you look upon Copple Crown and Moose Mountains. To the northeast and north, you can see the Ossipee Range and part of Lake Winnipesaukee. At the back of the clearing is a high-accuracy GPS receiver with an informational sign. The trail continues a gradual descent past the clearing, and at 0.4 miles past the summit, bear left at a junction with Mt. Rowe Trail, continuing on Ridge Trail. The trail descends quickly to a col, then climbs again, soon reaching another semi-open area with views back to Mt. Rowe. Just past this viewpoint, the trail reaches a ski trail and climbs moderately in the woods alongside it. After passing Benjamin Weeks Trail on the right and going by the top of the Tiger Triple Chairlift, the trail begins to pull away from the ski trail. It soon begins switchbacks through the fairly steep, dark woods. After 0.7 miles of climbing, the trail turns further away from the ski area and begins to contour across the slope. It becomes rockier and traverses with minor undulations. In 0.2 miles more, you will be rewarded with a good viewpoint to the north and northwest. This viewpoint takes in the southwestern White Mountains, including Carr Mountain, Mt. Moosilauke, and the Kinsman Range, and the Sandwich Range, beyond Lake Winnipesaukee and Squam Lake. Continue 0.1 miles and the trail intersects Winter Shortcut. Turn left and head uphill just a few steps, where Gunstock Mountain Trail comes in from the right. Notice a rocky viewpoint next to this trail. This outlook offers a vista to the southwest and includes many distant peaks, including Killington Peak, Mt. Monadnock, Mt. Kearsarge, Mt. Cardigan, and several others. Both of these outlooks view different directions than the summit view. Continue another 0.2 miles on this trail to the summit. You will pass Brook Trail, your descent route, on the right, then emerge on a ski trail just below the summit. Head down to the observation deck for picnic tables and a good place to enjoy the view. 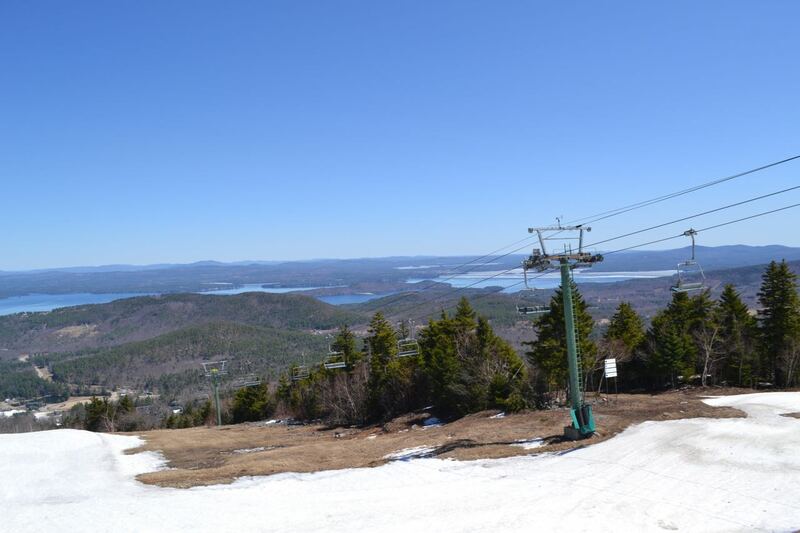 Gunstock's summit panorama presents a sweeping perspective on Lake Winnipesaukee. The view is best to the northeast, toward Green Mountain. The Ossipee Range is in full view to the north across the lake. The Sandwich Range appears to the left, but is restricted by trees. By moving up to the Panorama Chairlift, you can see across to nearby Belknap Mountain and its towers. To descend, walk back down the ski trail and enter the woods the way you came up, then fork left onto Brook Trail. The trail descends moderately through the woods near the ski trail for 0.3 miles, then reaches a junction with Saddle Trail (this trail can be used to make a side trip to Belknap Mountain). The trail continues its descent at a distance from the ski trail for 0.3 miles more, then swings back toward it and emerges at the edge of it. Head directly across this ski trail and follow a short connecter ski trail to another one. Look for the trail entering the woods just to the left of a snowmaking gun and the entrance to a ski glade. The trail descends through the woods along seasonal streams before swinging to the right and following the east wall of a drainage between ski trails. Look through the trees when the water is high for glimpses of small cascades in the bubbling brook. The trail soon enters the ski glade from the left. Stay on this side of the glade and follow it to its end at a ski trail. Just before emerging onto the ski trail, the path bears left and stays in the narrowing patch of woods between two ski trails. Brook Trail finally crosses the ski trail 0.7 miles from the last one. Head straight across and follow the trail back into the woods. In 0.2 miles, it descends to cross another brook, but quickly crosses back, so both crossings can be avoided if desired. It then crosses another ski trail into a final patch of forest between ski trails. It descends through this one for 0.2 miles, crossing one brook, then emerges on a ski trail near the base area. Continue into the open, where you have a clear view back to the summits of both Gunstock and Rowe and you may contemplate the delightful trek which you have just completed.